Parked cars is the downtown issue, not streetcars. 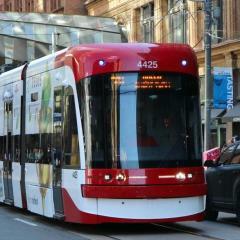 Streetcar average 15km/hr depending on route and time of day, what is the average speed of a parked car? So what is it that slows/blocks everything downtown? Yuuup!!!! I know, but haven't you seen right hand drive vehicles here? There all over, seems like more than ever. I don't know if they require special permits for them, I kinda doubt it. As long as the vehicle is mechanically safe and the driver has the required licence and obeys traffic laws what difference does it make what side the steering wheel is on? As for over there, I kinda doubt it too (special left hand drive permit), but if so it's not like said permit can't be obtained, but how much would they really drive it if it's a museum piece anyway? If it passes whatever laws/regulations why wouldn't it be? People that say "Happy New Years" instead of "Happy New Year"
LOL, That would be quite a drive to get to Sheppard Station from there. Why should that be awkward? I guess if you attempt to demonstrate it, it would be awkward. To avoid being awkward just say what it is. A lame dance move. Just leave out the part about guys liking to watch it. I've felt fine in all but maybe 1 or 2 over the last 5 weeks. Granted it hasn't been very cold for each day in all those 5 weeks, but even on the cold days, I've felt fine. Perhaps you are not dressing according to weather conditions? How would one know if he/she would or would not like an answer to a question he/she has if he/she did not first ask said question? Something to do with structural integrity of the bridge. I guess it's at or too close to the tolerance set out by whatever agency for safety so it's been closed to avoid the whole thing collapsing. Who's on first, What's on second, I Don't Know's on third. A TTC official eh? I didn't realize the TTC had those. What do they officiate over? We just do it. Age is of no concern the vehicles are still fully capable of pushing others around. It's a tedious process, but ya gotta do what you gotta do. I don't know what the stats are on breakdowns, but I don't think they are as common as you would think considering the age of the vehicles.